IPN has a piece about ongoing pensions reforms in Turkey. Although Turkey is currently involved in difficult and lengthy negotiations about its accession to the EU, it is interesting to observe the model character that the Pensions Directive apparently has developed for accession candidates. While it's difficult to generically denounce Germany's recent decision to raise the retirement age from 65 to 67, the chorus of criticisms about the hesitant way with which this is implemented gains traction. Deutsche Bank Research has a short comment which nicely demonstrates the negative results of an inconsistent implementation. 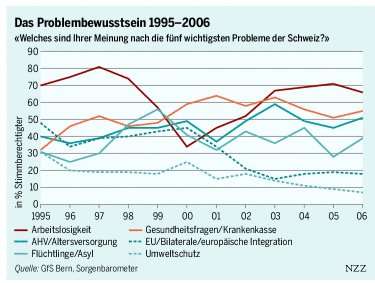 The periodically updated Swiss Worry Barometer gives a representative view of the most pressing worries in the Swiss population at large and is thus carefully monitored by politicians. My visual reading of the graph indicates that retirement provision (AHV/Altersvorsorge) seems to be the only problem with a positively sloped trend line, so it's just a question of time until it overtakes Health and Unemployment as more dominant worries. In his recent speech about the role of the pension sector in the economy, Nils Bernstein (Chairman of the Board of Governors of the National Bank of Denmark) traces the path of the small, open Danish economy with its development towards a sustainable budget and private sector savings leading to Denmark going from a debtor to a net creditor nation with a multi-pillared private retirement system. But all is not well: The pension sector is divided in two subsectors of almost the same size - commercial pension companies and labour-market pension funds. While there is practically no competition in the latter, the former shows a strong concentration with 90% of the market under control of the five largest firms. Yet, the commercial sector has a higher average cost base. The UK Pensions Regulator in cooperation with the Pension Protection Fund has issued the first edition of the Purple Book, a comprehensive overview of the British DB pension universe risk profile which is to be updated annually. The overview is based on detailed information of ca. 5'800 schemes which represent about 50% of all schemes or 85% of members. It contains information about scheme demographics, funding, funding sensitivities, insolvency risks, asset allocation and short term risk concentration. "A 0.1% point increase (reduction) in gilt yields reduces (increases) aggregate scheme underfunding by around £13bn. A 2.5% increase (reduction) in equity prices reduces (increases) scheme underfunding by around £11bn. A 10% increase in equity markets would eliminate the deficit as would a 0.3% rise in gilt yields. Each year added to the longevity assumption used in the s179 valuation would add 3 - 4% to pension scheme liabilities, raising the deficit by around £20bn." The aggregate asset allocation continues to show a massive concentration in equity (61%), although this has come down from 73% in 1997. 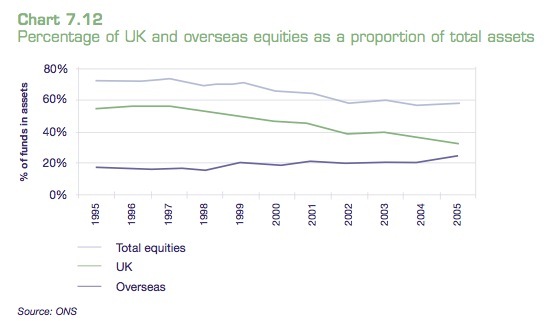 The share of UK equity has fallen disproportionately, as shown in the chart. The complete documentation (slides & materials) of the recent IZS seminar on European pensions from a Swiss perspective is now available online. IPE refers us to a new comparative study of the minimum technical provisions for DB pensions in the EU by GCactuaries. The paper's title is somewhat misleading as it only covers the EU15 at this point, even though it purports to be up to date, in fact looking into the future (31 December 2006 according to section 2). More likely though is that the results rely entirely on the pre-Directive transposition scenario of 31 December 2005. The study does explicitly not cover demographic assumptions. It finds a very wide variation between countries in the methods and assumptions for assessing minimum technical provisions, and it expects that subsequent to the transposition in particular of Art. 15 of the Directive, there will be significant changes in the way discount rates and other assumptions are determined, especially where discount rates are not set with consideration to market rates, as is the case in the majority of countries. Here is the text of a short presentation I gave this morning on the occasion of the General Assembly of the European Federation of Accountants in Brussels. The general consensus emerged that there is no direct connection between financial reporting at the micro (firm) level and macroeconomic stability. This differentiation is crucial in the debate. The subsequent Panel on the Internet - An opportunity to empower investors through accessibility or a risk for the reliability of financial information? with the US SEC's CIO Corey Booth among others made me doubt whether the European profession is really aware of the drastic impact that XBRL as a disruptive technology is going to have on the financial reporting value chain. P.S. Other conference documents are available at the FEE's website. This way, it should be possible to move away from the current standard's black or white approach to classifying pension plans as DB if they do not match distinct DC criteria. Much of the article is dedicated to the analysis of Swiss and Belgian plans which by law feature a mix of DB and DC characteristics that force such plans to be accounted for as DB. Faithful representation of the economic reality of plan liabilities appears to be much better warranted under such a structured approach. Furthermore, corporate sponsors' risk management towards pensions liabilities will be much improved, if not enabled, since the industry has built a lot of experience in structured instruments. Some preparers may be fazed by the approach's additional complexity, but once they realise that it might actually help them to better mitigate risk, they ought to embrace it. 1. Complexity of pension regulations affects European competitiveness: Dealing with disparate national regulations of pension plans is especially difficult in Europe, affecting all multinationals with sizable operations there. Three out of four experts surveyed consider the complexity of pension regulation in Europe as a factor affecting labour competitiveness. According to the study, this has resulted in increasing the determination of multinationals to seek a greater level of consolidation of pension affairs in Europe. 2. Multinational firms will lead the way: The survey shows that although pension systems currently remain country-specific, multinational firms have taken the lead in driving cross-border pension integration. They have influenced the direction of the market into designing and implementing pragmatic solutions for the management of global pension arrangements. 3. Clear shift of risk from company to individual: Although there are differences between countries regarding the relative use of defined benefit and defined contribution plans, there is broad consensus among experts surveyed that the global trend of shifting risk and choice from a company's balance sheet to individual employees will continue. P.S. Thanks to Aegon for sending a copy of the full report. It is striking that despite of the Swiss pensions market's relative size and maturity, none of the 115 experts queried represent a Swiss firm. Have Swiss pensions entered the dubious realm of insignificance? In line with our earlier note, Allianz has kept word in presenting a pan-European pensions product called ComPension. As the product is only on offer in Germany, Italy and France, the pan-European aspect is rather limited at this point, but the offering is intended to be expanded gradually to further EU member states. The product is based on a universal investment concept and seems to cater for the German Durchführungswege fund and direct insurance, thus is limited to defined contribution. It seems to enable corporations to offer comparable provisions across the countries covered by the plans, and it offers an annual overview of effective implementation. Available investment vehicles are Luxembourg based Allianz European Pension Balanced or Dynamic. According to Allianz' statement, these vehicles are invested primarily in European shares and pension funds, which is rather surprising since the equity portion ought to be allocated globally. We will try to get a closer look at the detailed product features. There have been a number of reports recently (example) that gave rise to the perception that the UK FSA "ditched XBRL" in the context of its new Mandatory Electronic Reporting (MER), and that this was new news. Given the FSA's weight as a leading European financial regulator, this would appear like a major setback to XBRL's global momentum. However, this perception needs to be qualified. A recent FSA statement maintains that the stated position is a simple reïteration of a policy established earlier, hence the reports are repackaged old news. The FSA continues to develop its MER system using XML, which can be described as a related, but more generic file format version of XBRL. A later migration from XML to XBRL is thus by no means precluded, especially seeing the FSA's main concern that there is not "sufficient XBRL experience within the UK currently to develop this system without incurring additional cost and risk". This assessment is transient by nature. That being said, it appears unfortunate that the FSA backtracks behind its 2004 committment to XBRL, namely to develop and publish an XBRL taxonomy. This would be a more appropriate way going forward, rather than deploying a mature technology in a newly implemented financial market infrastructure project, with which the FSA could play the rôle of an essential catalyst.